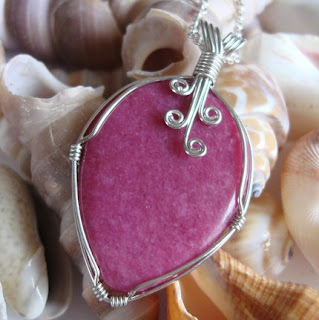 I am IN LOVE with Chileandreamer’s wire wrapped stone jewelry! Everything in her shop is so pretty and sparkly! I have a crystal collection and my favourite type of jewelry to wear is actually crystal jewelry. I think you are all going to be as enamoured with her shop as I am. I am truly a crafter at heart, and have so much respect for people who craft with their hands! I love to sew, both by hand and with the horribly seductive convenience of my sewing machine. Music is another passion of mine; I am a vocalist and have played piano and cello since an early age. I have a fantastic husband who is wonderfully supportive of my jewelry work, and who makes me laugh everyday! My specialty is wire-wrapped designs. Most of the stones I work with inadvertently fall into one of two categories. There are stones that look best wrapped very simply to feature the stone (such as the Blue Fire Opal necklace and earrings), and there are also stones where I can let my creativity flow further and create intricate wire designs that are reminiscent of nature or emotion. I am a great fan of jewelry that speaks secretly to you; wearing a necklace that puts you in a specific state of mind, or that means something just to you. Nearly all my inspiration comes from the stone I’m working with. I am always inspired by unique new stones with new colors and textures and patterns – I’ll see a stone and my brain instantly starts designing! Sometimes there are parts of the stone I want to feature, such as stripes I can accentuate with wire lines. I love working with a great variety of colors to evoke different emotions. Sometimes the wrap design reflects my state of mind or a state of mine I want to evoke in others. 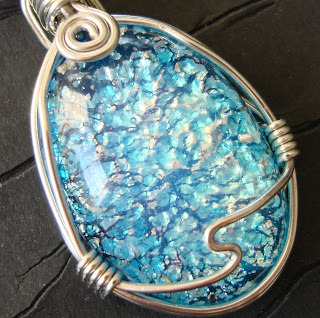 Liz was so kind to send me my very own Blue Fire Opal Necklace for review. One word- BREATHTAKING! I have never seen a Blue Fire Opal before and I can’t get over how pretty it is. It simply dazzles especially under the light and you can see even more colours when you look deeply into the stone. This necklace is part of a set and comes with matching earrings. I wore it just day to day and I know it would be perfect for a fancier event. The price is awesome at only $15.95 and is definitely a great buy. The quality of her workmanship is top notch. This necklace would make a beautiful gift for yourself or someone special in your life.